The primary objective of this article is to explain how to enable and configure the Groups on your site. Please read it completely to understand all of the available options. Navigate to the site Backend and from the Components drop-down menu, select JomSocial > Groups. Locate the Groups settings and make sure that Groups is enabled (it is enabled by default). Allow guests to perform Search Groups - Enable or disable the ability for guest visitors to search groups. Moderate Group Creation - If enabled, the Administrator will have to approve every new Group. Allow Group Creation - Allow all users to create Groups. Group Creation Limit - Maximum number of Groups user can create. 0 for unlimited. Group photos upload limit - Maximum number of photos that can be uploaded to a Group’s Albums. 0 for unlimited. Group video upload limit - Maximum number of videos that can be posted in a Group. 0 for unlimited. Enable group Announcements - Enable Announcements in Groups. Enable Group Discussions - Enable the Discussions feature. Enable group photos - If enabled, Photo Ggalleries will be available in Groups. Enable Group Videos - If enabled, users will be able to post Videos in Groups. Enable Group Events - If enabled, users will be able to Create Events in Groups. Enable notification for new discussions - This feature will send the new email notification for all members of the Group if there is a new discussion. Group file upload limit - Maximum number of files that can be uploaded to Groups. 0 for unlimited. Enable file sharing for discussion - If enabled, file uploads will be available in discussions (if the Discussions File Upload is enabled within the individual Group’s settings). Maximum File Size - Set the maximum File Size of files. Enable Poll - This option will allow every attendee of the event to create Poll. Default JomSocial templates have the option to show the Latest Groups on the Frontpage to public or registered members, as well as hiding it completely. Navigate to Components > JomSocial > Templates and open the template that is currently in use at the site. Locate the option, Show latest group - This option controls the visibility of the Latest Groups box on the Frontpage. Frontpage Recent Groups - Determines how many recent groups will be shown in the Latest Groups box on the Frontpage. Group List - Choose to display either the latest or featured groups in the Frontpage box. 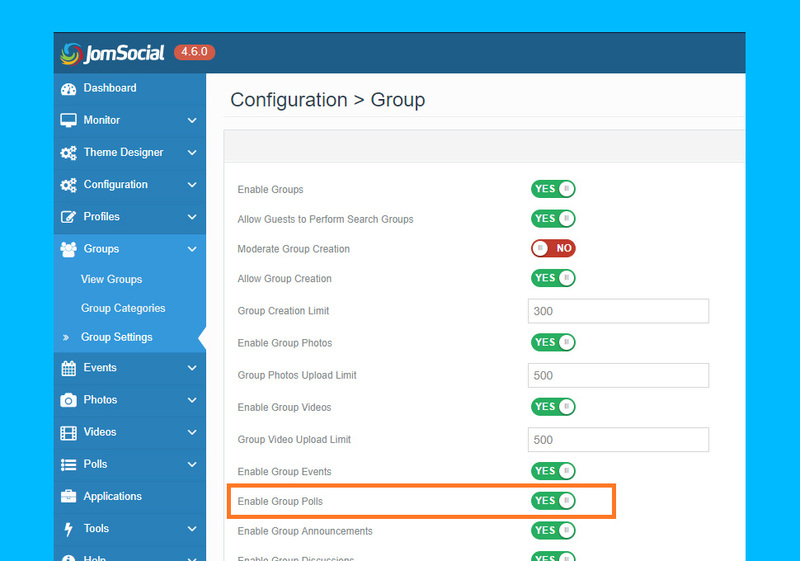 Under the Anti Spam pane in JomSocial configuration, you can set the maximum number of Groups a user can form on a daily basis. Allow group creation - If you set this to No, it will completely disable group creation for the specified Profile Type, overriding all settings.